THPBlog: Sierra Pacific Industries to clearcut north of Arnold, CA and near the North Fork of the Mokelumne River. 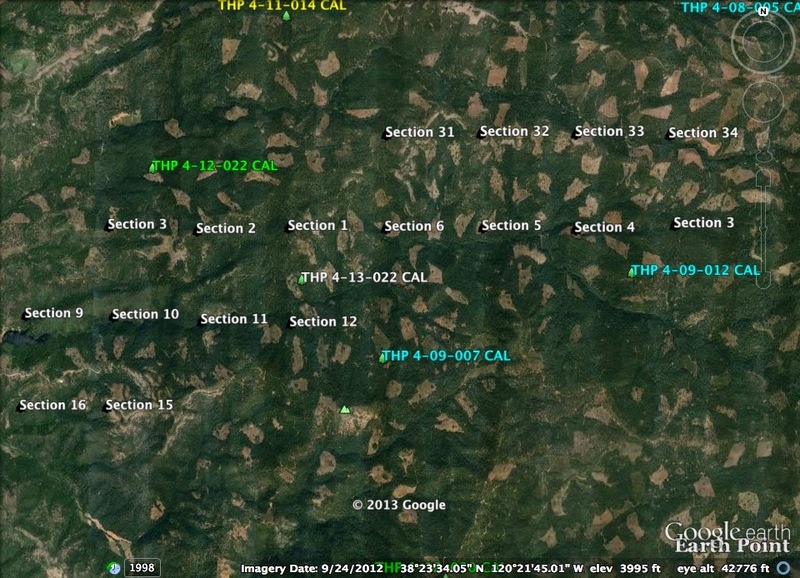 Sierra Pacific Industries to clearcut north of Arnold, CA and near the North Fork of the Mokelumne River. 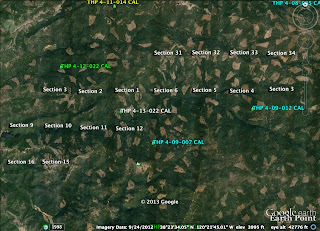 THP 4-13-022 CAL (So Schaad THP) Sierra Pacific Industries, 1090 acres; 61% clearcut, 22% no-harvest, 17% selection, misc roadside logging. Schaads Reservoir, Lower Forest Creek, Upper Forest Creek (MD: T6N R14E Sec.1, 2, 3, 9, 10, 11, 12, 15, 16; T6N R15E Sec.3, 4, 5, 6; T7N R15E Sec.31, 32, 33, 34). Winter operations, high erosion hazard, steep slopes up to 65%, 9 unstable areas, road failure sites, herbicides, 12+ CA spotted owls within 1.3mi, 3 goshawk territories nearby, golden eagle sighting, threebract onion, trees up to 74" dbh. Estimated public comment deadline: 11/25/13. This THP is 9 miles north of Arnold, CA and Highway 4 at an elevation of 3,000 to 5,000 feet in ponderosa pine, sugar pine, white fir, Douglas fir and incense cedar forest. Sierra Pacific Industries is planning a mostly clearcut tractor and cable logging operation on steep and unstable soils near the Middle Fork of the Mokelumne River. The THP area has 9 unstable areas including steep swales, fill failures and road slump failures. There are 14 segments of new road construction totaling 11,650 feet, and 224 acres of operational area are proposed around defined units for skidding, yarding, landing use, tail holds and fire line construction. Sierra Pacific Industries is planning to use an existing tractor road in a class II watercourse, reconstruct a seasonal road in a class II watercourse, and use an existing landing in a class III watercourse. An excavator is planned for site prep on slopes under 50%, and on slopes under 30% that lead without flattening towards a class II watercourse. There are 23 road drainage sites planned for work including dip construction, rocking, culvert repair and replacement, and road bed stabilization. One golden eagle was reported in section 6 in 2004, and there are 3 goshawk territories in sections 4, 7 and 11. Potential habitat for three bracted onion was reported to be in units 394, 1953, 1991, 3589, 3600, 3681 and 3991. More information is available on the THP Tracking Center website. I love Chainsaws. Cutting wood is great. Awesome. We need lumber. But how can any reasonable person look at a satelite image of all the clear cuts in the Sierra and think that we are doing it in anything remotely close to a sustainable form?